131 ‘cubesats’ – satellite cameras (that are each about the size of a shoebox) are being primed for launch over the next 12 months. These cubesats will snap a daily photograph of the earth from space, building a Google Earth-style composite image of our home planet, the main difference being that, unlike Google Earth, this picture will update itself approximately every 24 hours. The first batch of 28 cubesats (known as ‘doves’ by Planet Labs), were launched in February of this year and are currently passing over earth at a speed of around five miles a second. Amazingly, they can produce images detailed enough to pick out individual trees. In addition, Planet Labs may be looking to send only its ‘doves’ into our stratosphere, but critics are concerned that such moves are already paving the way for the hawks to join them. Frankly, this has a lot of people worried. The old saying that, ‘just because you can, doesn’t mean you should’, does, for many, apply here. Thomas Immel, who worked for twenty years at the Space Science Laboratory at UC Berkely, compares this new initiative to the opening of ‘Pandora’s Box’ from Greek mythology. He maintains, “Some applications may be harmful or controversial”. For all the potential good projects like this can achieve, the possible cost to personal freedom is, in many people’s humble opinion, simply too high. While many of my readers are interested in some of my own content pieces, here is one i found rummaging around stumbleupon it’s much better written than I could ever hope to achieve. Maybe at some point I will get to their level, you never know. Every now and then a news story comes along that simultaneously lifts the spirits and restores one’s faith in Humanity. This is one of those stories. Three students in New York City bought a second-hand couch from a charity shop for $20.00 and discovered an astonishing $40,000 in cash (that’s about £24,000, in case you were wondering) tucked away in several envelopes that were nestled between the cushions. After finding $40,000, he must have been positively delirious. In and of itself, that would be an amazing story, but here’s the REALLY amazing part; the three friends actually tracked down the rightful owner of the money and gave it back. New Yorkers (well, they live in New Paltz, just North of the city, so ‘New Paltzers’ is probably more appropriate), Reese Werkhoven, Cally Guasti and Lara Russo found a mysterious name on one of the envelopes and decided to try and return the cash. “We all agreed that we had to bring the money back to whoever it belonged to…It’s their money, we didn’t earn it” said Ms. Guasti. When they tracked down the rightful owner of the cash, it turned out to be an elderly woman’s life savings. 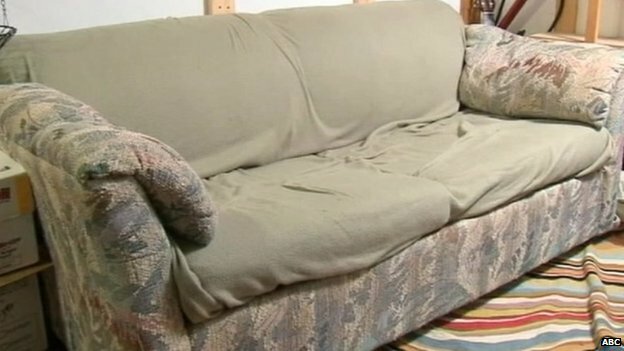 The woman’s daughter had donated the couch while her mother was in hospital awaiting surgery and was completely unaware that her mother’s life savings were hidden inside it. The woman (who did not want her identity revealed, for fairly obvious reasons) said that she had been saving the money for many years. Her husband had given her some funds to put away each week before he sadly died of a heart condition. She had continued to stash the money in his stead and, over several years, had amassed the small fortune discovered by the three friends. Ms. Guasti said that the old woman believed that the discovery of the money by three honest and caring people was her husband’s way of looking out for her. She said that she felt it was “supposed to happen”. For their troubles, the widow gave out $1,000 for the friends to share. I don’t know about you, but that one brought a tear to my eye! See, its not all doom and gloom. Not even students are all bad! 38-year-old computer programmer Gal Sont is developing revolutionary new software to aid disabled people in communication, even as he faces paralysis himself. Sont suffers from amyotrophic lateral sclerosis (ALS – alternately known as ‘Lou Gehrig’s Disease’), which he was first diagnosed with in 2009. Due to this disease, the neurons that govern voluntary movement (located in the brain and spinal cord) are slowly dying out, which means that Gal is likely to eventually suffer from ‘locked-in syndrome’, a cruel affliction wherein the mind is aware and conscious, but the body is completely unable to move or speak (usually only the eyes are voluntarily controlled). Tragically, there is no known cure for this condition. When Sont (who, even today, can only stand when aided – and only for a few seconds at a time) met other people suffering with similar disabilities, he found that they were increasingly resorting to expensive (and often-inefficient) computer setups in order to help them better communicate with the outside world. “I came to realize that these people first of all don’t understand the potential, what technology can do for them, they use all kinds of different equipment which was very expensive, and as I know technology I didn’t understand why they were so expensive”, Sont told BBC News earlier this week. Sont and his best friend Dan Russ are business partners in the Las Vegas, Nevada, USA-based start-up company Click2Speak, which aims to create a fast, efficient and accurate on-screen keyboard (created by Sont –using only his eyes) in order to aid people with physical disabilities. The driving force behind the invention is to create an affordable product that is better than anything else available right now. Click2Speak makes use of an ingenious eye-tracking camera that allows the user to control the cursor on a screen, or click buttons on a virtual keyboard, simply by looking at them. Clicks can be made using a foot pedal, or by holding one’s gaze on a specific part of the screen. Gal’s computer makes full use of his Click2Speak software and he is able to control his entire desktop (including email, Skype, video games and, perhaps most importantly, the creation of code – the way in which he makes his living) using only his eyes. Click2Speak is fully integrated with the SwiftKey Smartphone app, which is timesaving software that creates complete suggestions for half-typed words, based on the user’s previous word use. Essentially, the software grows easier to use the more it is utilized and this is a major part of Click2Speak’s design. As his illness progresses, Sont will be using his own software more and more to communicate with his family, friends and business colleagues. Gal Sont was born in Israel in 1976 and was fascinated by computers since getting his first Commodore 64 aged 8. He married his school sweetheart, with whom he has two daughters and has subsequently spent 20 years working as a computer programmer. He is also a big sci-fi/fantasy fan and he used to enjoy outdoor activities such as kite surfing, motor biking and riding roller coasters. By nature a proud man, Gal cherishes his independence and it is this desire to remain self-sufficient that has motivated him to create such an affordable software option for others facing similar hardships. “I never asked for help from anyone my whole life, it was my wife and I against the world, but now I need help and assistance, and it’s not too much fun to ask all the time for others to help you (…) If you can buy a communication device by yourself without begging others to help, this is also very, very good. So I hope the people out there who hear about our software and the keyboard, will be able to use it, save money and time, and live their life.” He says. It is clear that Sont’s miraculous mind will prove to be a life preserver, not only for himself, but also for thousands of others around the world. July 28th 1914 was a day that changed the world forever. A global war was declared that would last for four long, bloody years and would cost Humanity millions of lives. Although the images of the gruelling, inhuman trench warfare that was waged in France are the perhaps most indelible from the conflict, it should also be remembered that an awful amount of lives were also lost at sea. Britain alone lost over a thousand vessels from 1914 – 1919, together with about 89,300 sailors and merchant navy personnel. Germany lost hundreds of warships, as well as about 35,000 sailors. In addition, civilians were also caught in the ocean-going crossfire, as a German submarine sank the liner Lusitania in 1915, killing almost 2000 people in the process. As we approach the centenary of the First World War, the seafloors are littered with the stark, skeletal remains of vessels leftover from this conflict. In recent years, however, these ruined ships have come under an increased level of threat from salvage teams, looters and profiteers, many of whom are intent on destroying the wrecks outright. Shipwrecks such as those left over from the First World War, are a target for two main reasons. Firstly, they can be commercially exploited for scrap metals (and other artefacts) and secondly, fishing trawlers dredging the ocean depths in search of deep-sea fish can impact the ships, destroying them altogether. In 2011 alone, three British cruisers, the final resting place of about 1,500 sailors altogether, were completely destroyed because copper and bronze had reached sufficiently high prices as to make such destructive salvage exercises profitable. However, because the 100th anniversary of World War One begins this year, more and more of these ships will be protected by Unesco’s 2001 ‘Convention on the Protection of Underwater Cultural Heritage’, an agreement that extends International protection to shipwrecks over 100 years old. Many people worry that these laws will prove difficult to enforce, however. Others still are worried that this move will increase the destruction of shipwrecks from more recent times, in particular, vessels from World War Two (1939 – 1945), before they come under Unesco’s protection. Today, historians are attempting to use the centenary of the First World War as a way to educate people about the history and legacy of the conflict, as well as to demonstrate the cultural and historical importance of these undersea war graves. Many, including this writer, feel that such sites are deserving of our respect and reverence. Shipwrecks also provide a very good habitat for local marine life and can even form the basis for coral reefs (if left undisturbed for long enough). These vessels are also studied for scientific interest, with experiments carried out on everything from metal erosion to marine biology. At the time of writing, the British Government has failed to sign the convention. The last wild wolves known to have lived in Britain were killed in the 1700’s. When they died out as a native species, it ended the reign of a creature that had captivated the British imagination since time immemorial. However, unlikely as it might seem, wolves could be returning to our woodlands (in Scotland, to be precise) in the not-too distant future. In the most recent edition of the John Muir Trust (JMT) Journal, the conservation charity declared that there was ‘no ecological reason’ why wolves could not be reintroduced to Scotland. “We have the climate, the habitat and the food,” wrote JMT Communications Chief Susan Wright and Head of Land and Science Mike Daniels in a companion article to the journal piece. “Many are afraid of the ‘big bad wolf’ even though they are far more likely to be harmed by their pet dogs, or indeed their horses, than by a wolf, if it were present.” States the article. The environmental reasons speak for themselves, but there could be potential financial benefits to Scottish tourism as well. So-called ‘ecotourism’ is on the rise and travellers willing to pay to see wolves in their natural state are common throughout Europe. The systematic and chillingly efficient extinction of Scotland’s native wolf population involved organised hunts (not dissimilar to fox hunts, but on a far grander scale), as well as deliberate habitat destruction and the use of traps. It is a mistake of the past that it is now possible to repair. In Tasmania, to quote from a similarly dark chapter in ecological history, carnivorous marsupial the thylacine (or ‘Tasmanian Tiger’ as it was colloquially known) was aggressively hunted to extinction in the early 20th Century. The last remaining individual died from a lack of proper care in Hobart Zoo in 1936. The thylacine cannot be reintroduced to Tasmania, because the population simply wasn’t spread over a wide enough area when extinction came calling. However, the Eurasian Wolf has a chance that the Tasmanian tiger did not; it is a strong species, with an excellent chance of building a good-sized breeding population in Scotland, if reintroduced there. Eurasian Wolves were also in serious decline up until the 1950’s, even being rendered completely extinct in some areas of Europe. However, since that time, populations have been on the rise and reintroductions have become more common. You may be surprised to learn this, but there are even tentative plans to return brown bears, elks and grey whales to our shores. Could the grey wolf once again stalk its prey in the beautiful, untouched Scottish Highlands? For now, it’s just an idea, albeit a tantalising one.